The current bathrooms are spaces that remind us of a spa. However, the preference is in the mixture of the classic with the modern. 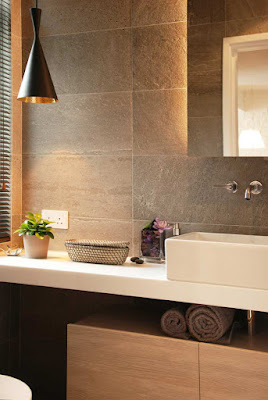 An aspect that has brought back the use of stone in modern bathrooms. Interpreted in different ways and with innumerable uses. 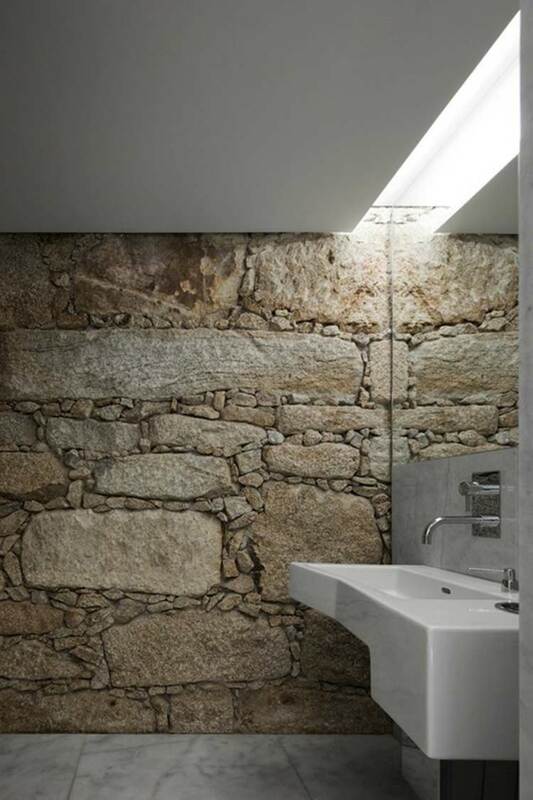 Above all, the stone walls in the bathrooms have found a great ally in the marble. Today we are going to see some inspirations that go even beyond this beautiful material. Keeping even the rustic details in the surroundings of a modern bathroom. 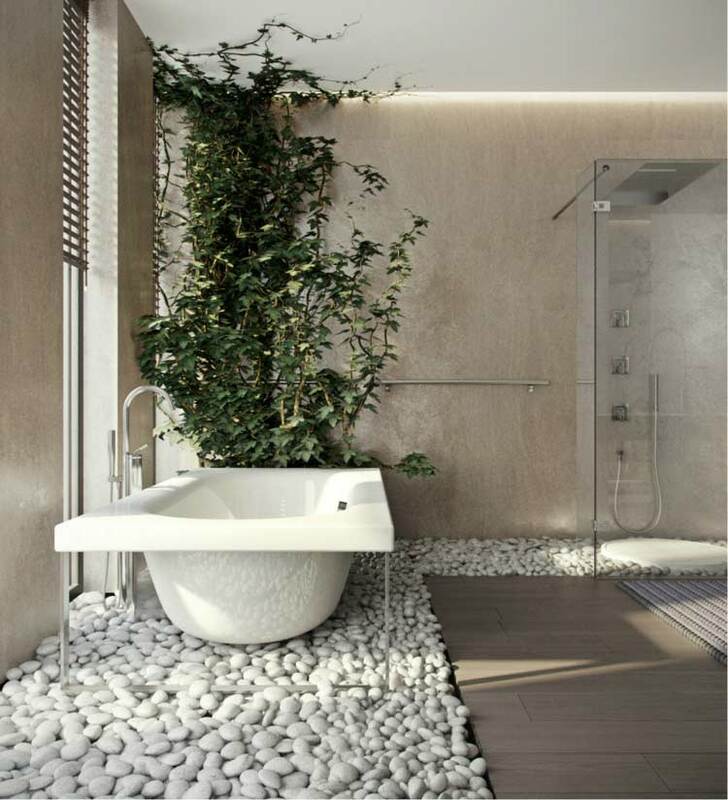 Something that will always make the bathroom look organic and elegant. So we recommend it as a good solution if you want to create a surprising bathroom. 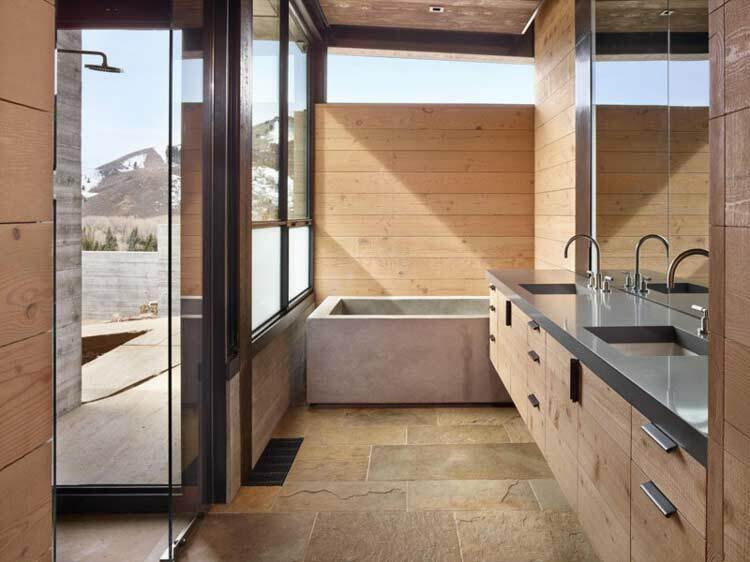 Often as we mentioned at the beginning it is a technique that has been associated with the rustic bathroom. This means that immediately in the modern bathrooms we relate it to the field in the same way. You can not separate the stones from the wooden beams. Many times when looking for this accent both variants are combined. 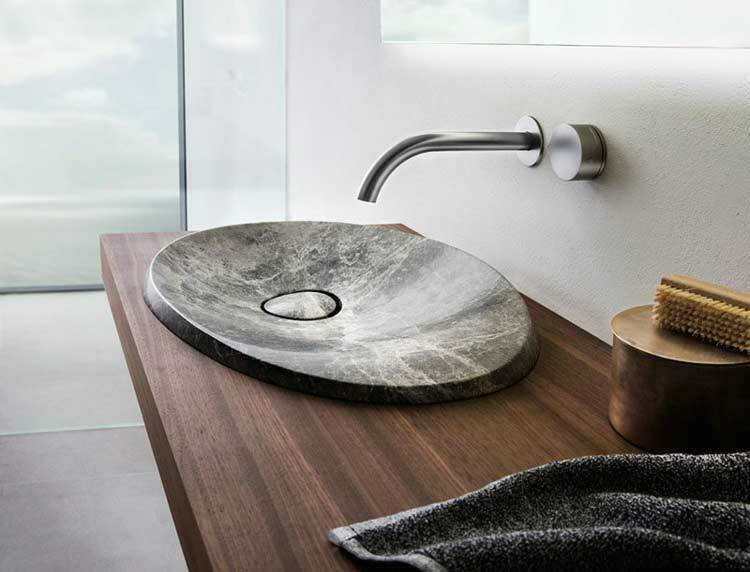 The stone range is very wide to select the right one. 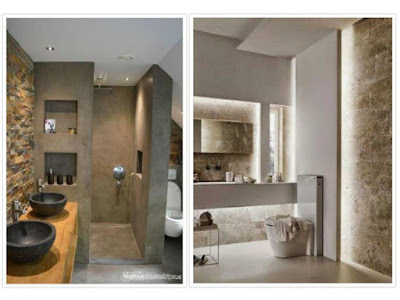 To select the right one, you can not forget the color scheme of the bathroom. It is also important the type and frequency of maintenance that will be required. At the local level, there are very good options for the bathroom to look authentic. 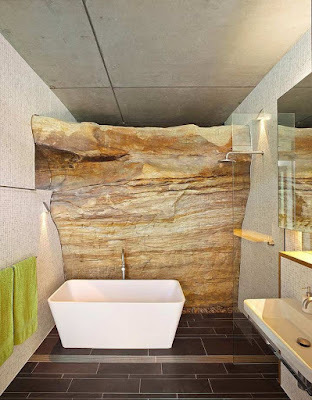 Best of all, the rocks do not conflict with the bright image of a modern bathroom. Nor is it wrong to try to reproduce in various details the appearance of the bathroom of a cabin or farm. 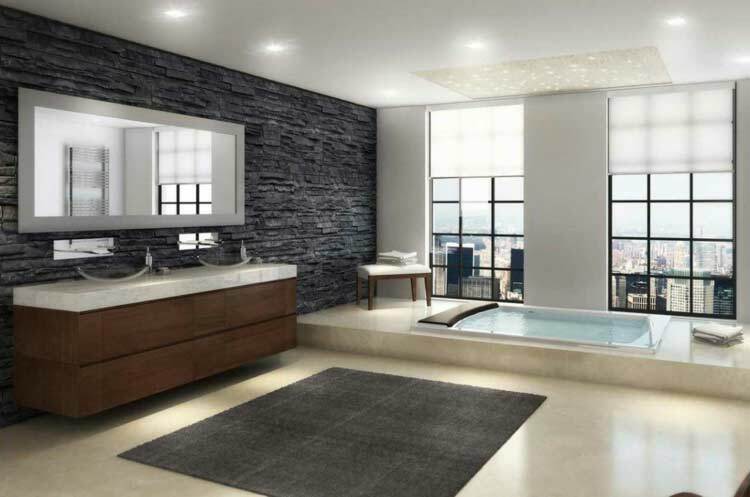 Both variants will allow you to enjoy a relaxing bath. 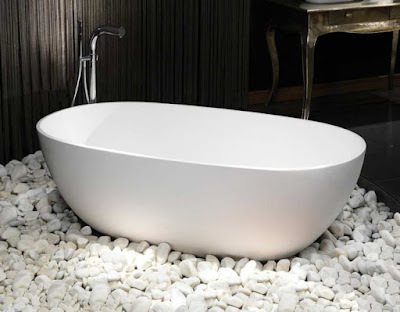 In general, bathtubs will have a large weight. Many manufacturers have incorporated stone into these creations. What would result in a unique and impossible to ignore accent. 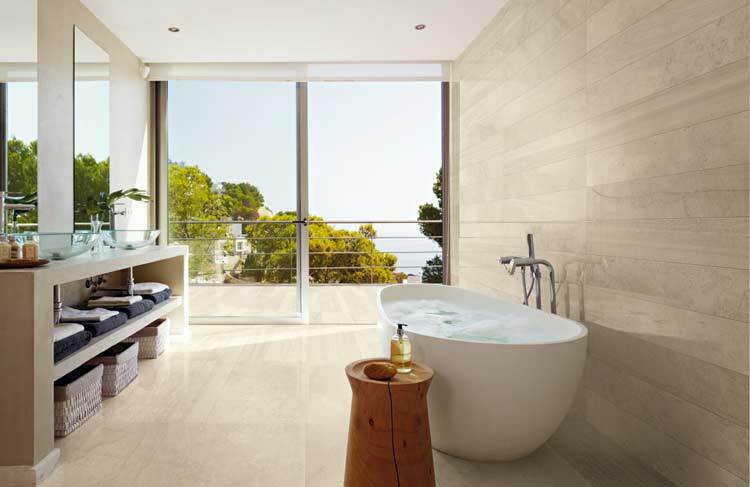 With a spectacular view, we will have everything you need to take a bath and admire the surrounding landscape. In a bathroom with these characteristics, you will not have to escape to any shelter in the countryside. The success of modern bathrooms is likewise influenced by the mix of styles. Simply several contrasting textures is another charming approach. 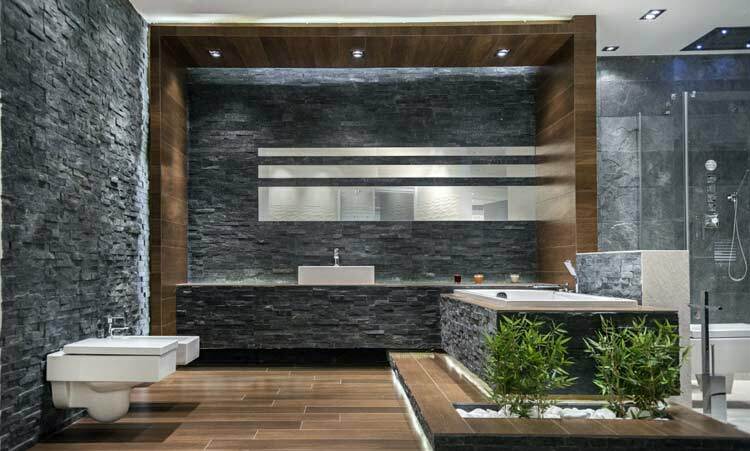 So you show your creativity and the modern bathroom becomes fun. 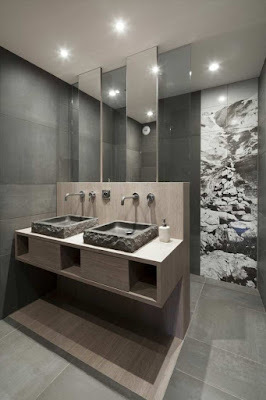 In these types of environments, a stone wall as an accent is the best idea to contrast the bathroom. Brings the texture of the stone improving the visual aspect of the whole. The possibilities are endless beyond any style we select for the bathroom. Let's say for a Mediterranean style bathroom it will look good with the arsenic type stone or on the other hand the limestone. The ones in Rio are the ones that look perfect in modern environments or rustic ones. The preferences for tropical baths have gained an important space and river rocks, for example, can not be separated from these spaces. Here they enter to play polished stone tiles or otherwise options such as dark granite. All with excellent potential so that your modern bathroom has a tropical accent that makes it even more relaxing. 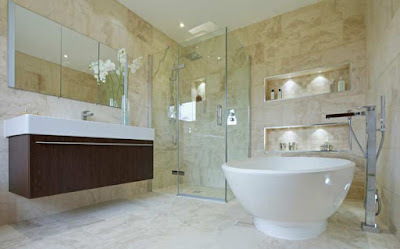 For modern bathrooms, the use of stone also means ensuring that they are in good condition. It depends a lot on the finishes and we will see it in detail a little later. However, in the rough type, they have an effect of greater texture but they will demand a greater attention for their maintenance. 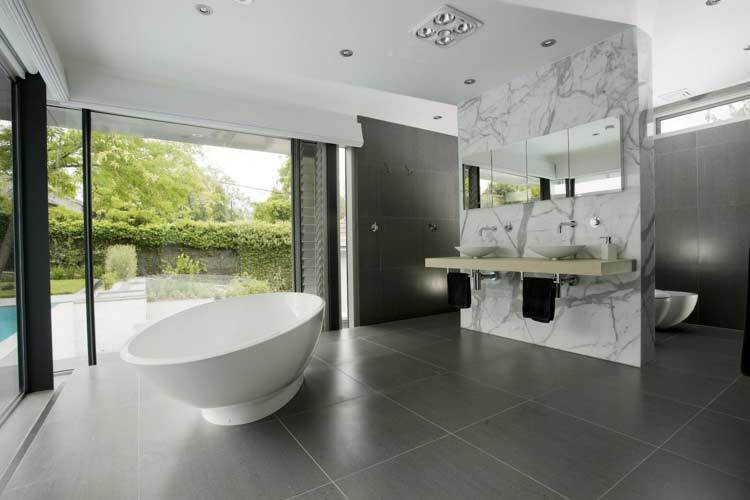 The extent to which the stone is included is a decision that we can take into account according to the size. 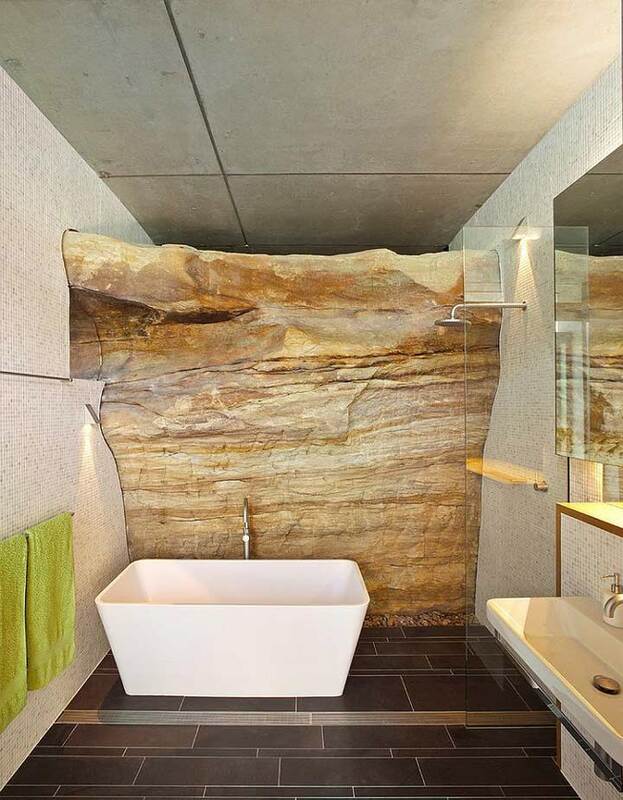 As a design option, this will be the main backdrop to highlight anything in our bathroom. 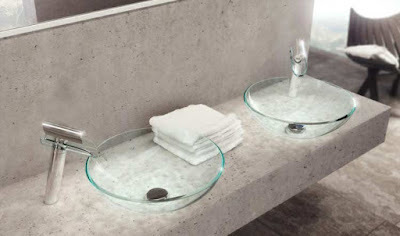 Other finishes, although they are stones, complete a textured gloss that is comparable to that of many modern surfaces. The accent with the stones has several areas of the bathroom that can be exploited. The area behind the bathtub is one of them. 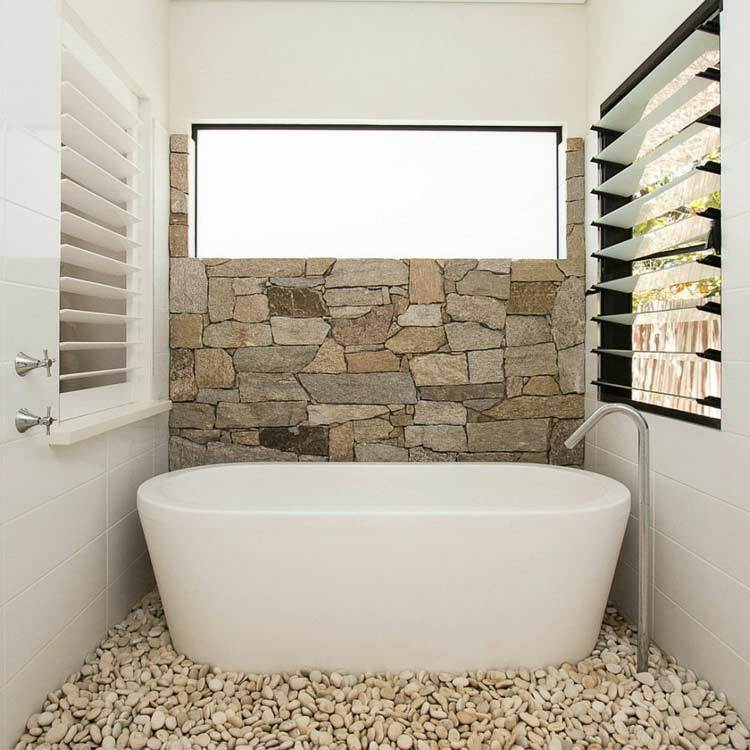 Another option is the shower area completing a captivating effect and that will last a long time given the characteristics of the rocks. Nor does size become a limitation when it comes to doing something exclusive and different in the bathroom. Even for the little ones, we find some impressive solution. So if you have a small bathroom do not worry that it is possible to give that beautiful natural and exotic look. 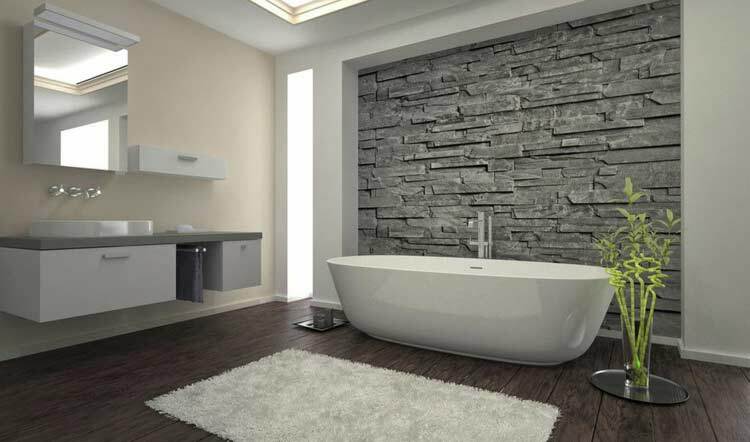 Without taking into account the type of stone this detail will become the definitive accent for your bathroom. 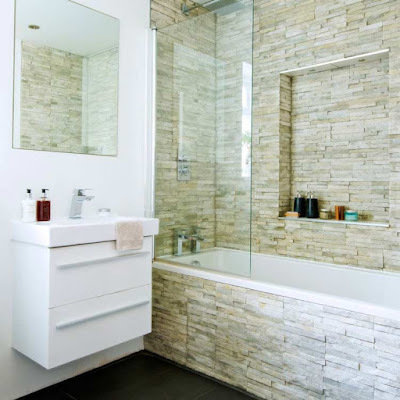 As we see in many photos of modern bathrooms, the walls are the most exploited site for the use of stone. 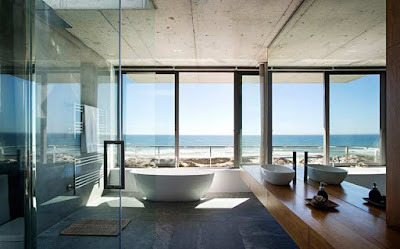 The reason is that in each space the walls are precisely what is appreciated from the first moment in any environment. That explains the reason why it is selected as the ideal site for stones. Nor are floors and even the roof excluded. In the case of the walls begins by placing a kind of strip. 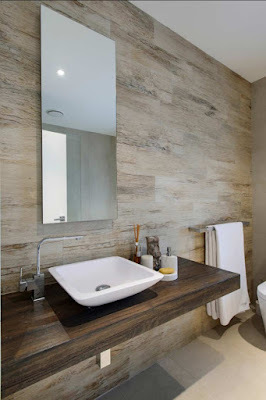 The idea is to cover the entire space or otherwise a nice accent wall. Do not lose sight of the harmony based primarily on color. It is not one of the most used solutions in modern spaces but for the ceiling, the best thing is an arch. 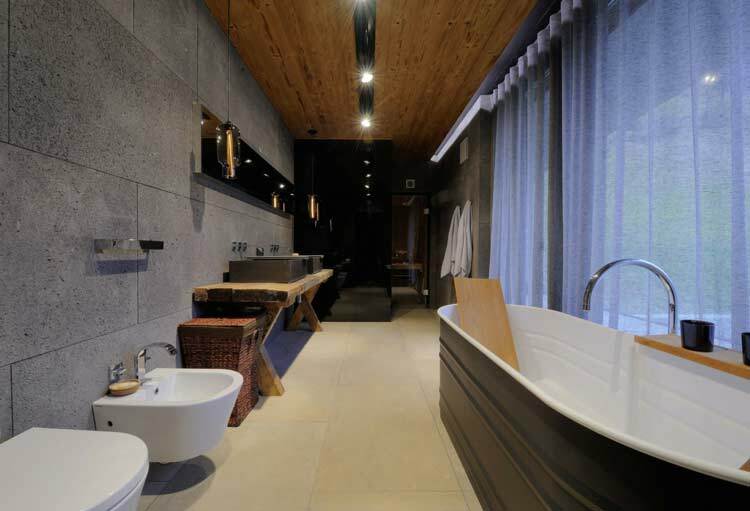 It is a very original idea to make a small nod to rural spaces. However, this does not make it exclusive to rural environments. They are usually very beautiful in an open bathroom that communicates with the bedroom. 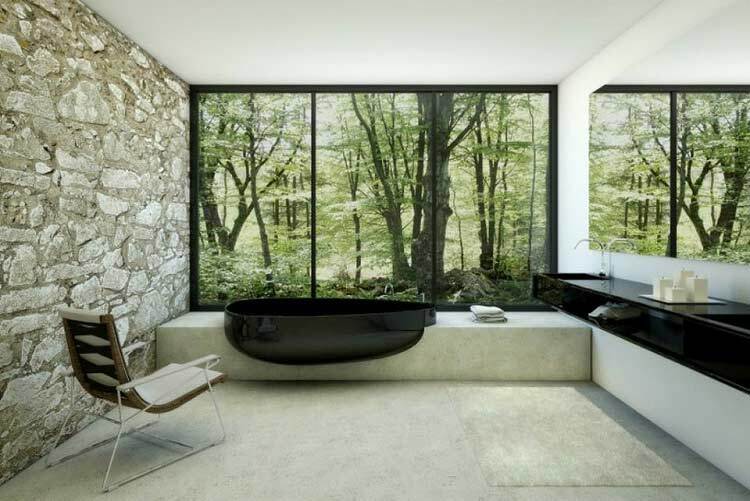 Even for furniture or windows, the stones can give the best of themselves. We can not overlook that regardless of the space where they are used and the type of stone should be properly sealed. It is a process that must precede the grout. This prevents any stains that may arise during installation. A detail that becomes very important when it comes to the roof. We all know how complex any work or maintenance in it is. 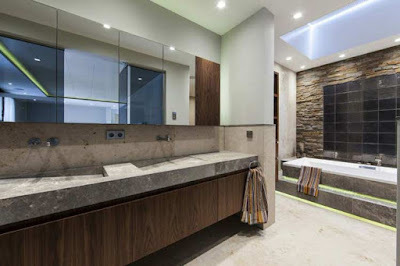 The stone is simply able to change the look of modern bathrooms even if it occupies small spaces. The sinks are an example of this and for the use that they have the stone is perfect. 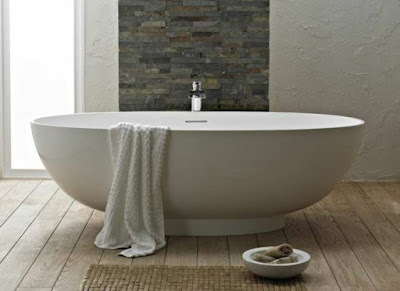 They are hard and resistant so in the bathroom furniture, they are practical and beautiful. 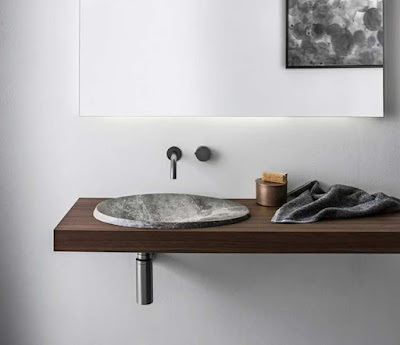 A sink or a discreet shelf will never stop being good ideas. 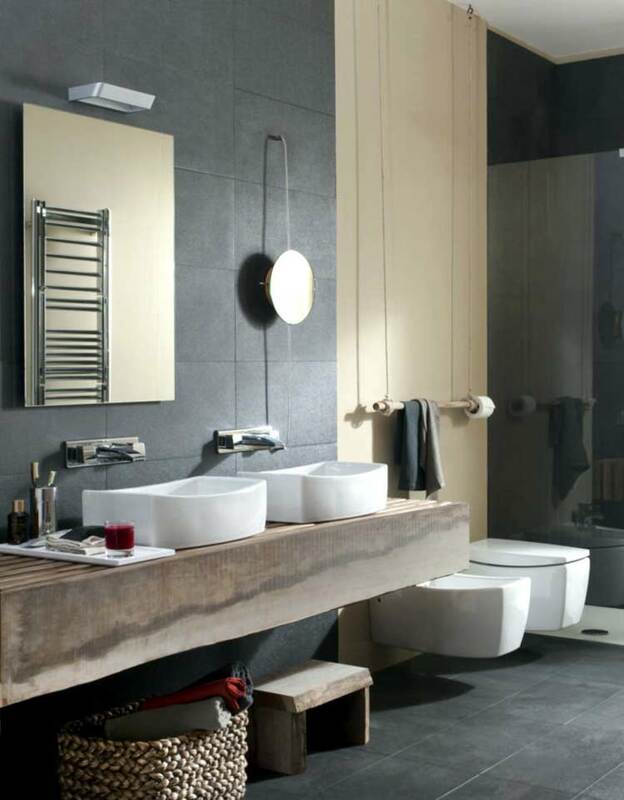 They are avant-garde options that will make a difference in a modern environment. 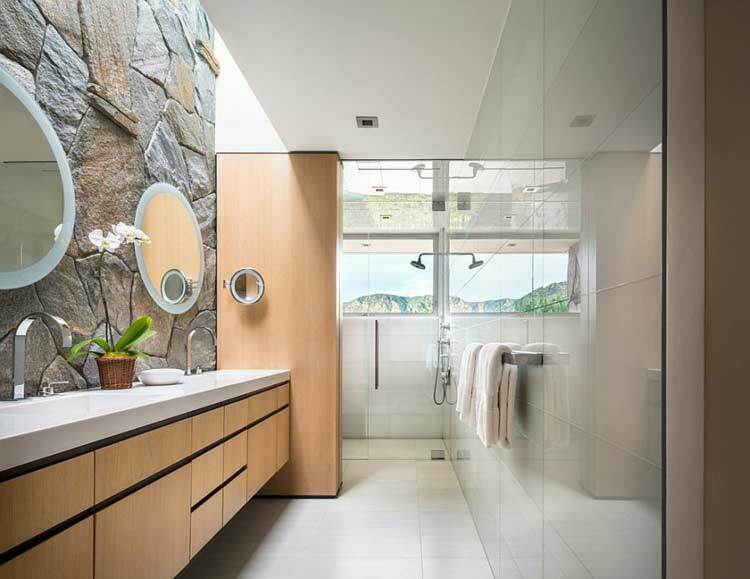 Take advantage of the windows from the floor to the ceiling to place the stones next to it. The vertical effect that is achieved completes the prominence of this material. The real thing is that the size of the windows does not matter so they have the necessary prominence. 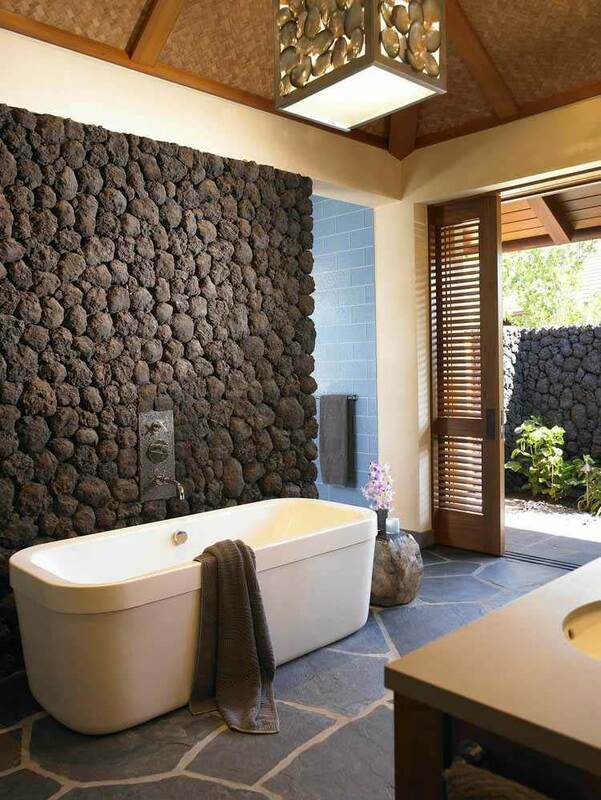 Let the stones take care of this detail covering them to match the whole environment. 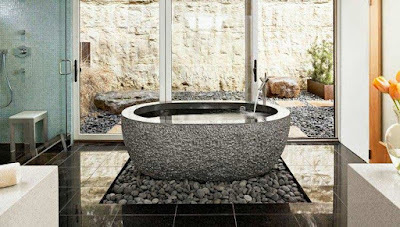 The river stones are on the other hand the ones that have the perfect charm for the shower area. Even for decoration, they would be perfect. You can even add color to them so they look fun, do not settle for the gray or brown characteristic of many. The combination of the stones in glass jars also makes it possible to highlight them in all aspects. 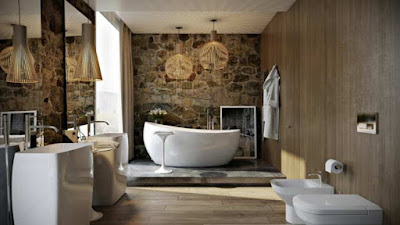 the candles will be another good outlet to create the atmosphere of peace that every bathroom needs. 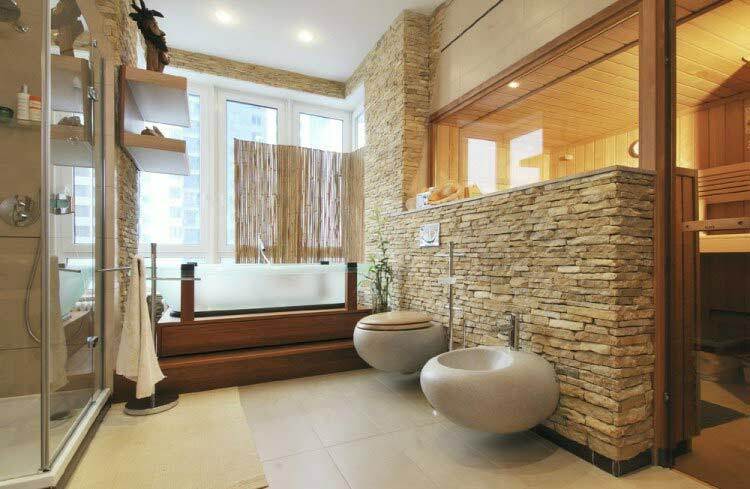 The same can be achieved if decorative accessories made of stone are added. 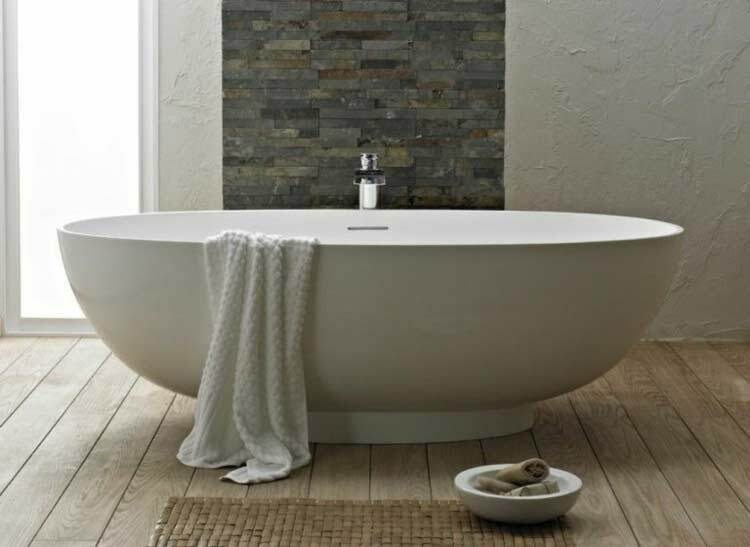 They will look great in modern bathrooms and if they share the texture of the walls even better. The decoration increases the natural character if some plants are added. Plants and stones are an incredible combination. Use pots of different sizes, depending on the space with which you count. Inside the pots, place some stones to highlight them. 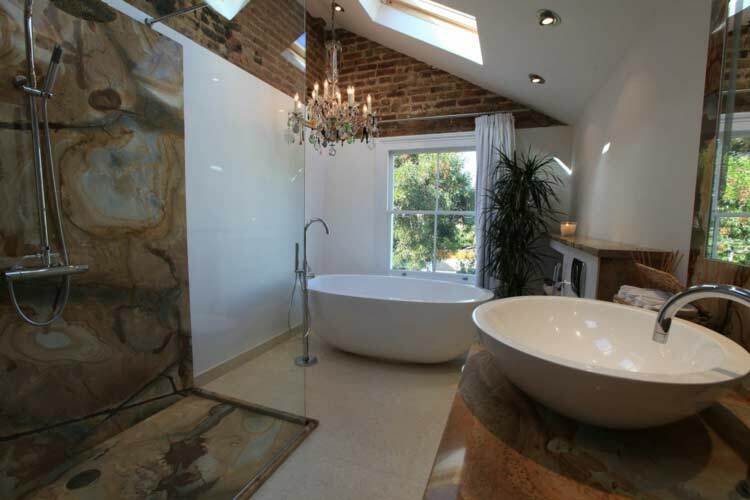 Simply take into account that the location should be close to a place with good natural light and ventilated. In addition to being placed on a piece of furniture, a large pot is not recommended. 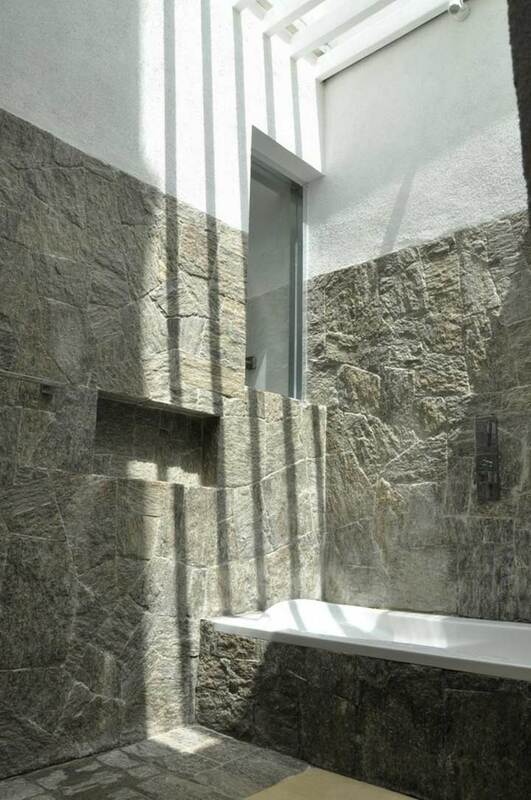 Previously we mentioned that although it is generally a resistant material the stone needs care. As we know it is attractive and we say relatively easy to maintain. This depends on whether it has been properly sealed. It may be the most difficult space to maintain the shower. Mold or fungi are the main problems that we will have to deal with. With the precise product will not become a problem, many are sold in any establishment. Take care of other surfaces near the wall and it is advisable to do a test in a small section. Mainly if it is the first time that we experiment with a cleaner. The rinsing should be at all times with cold water. In the spots, it is better to let it rest for about five minutes before removing it. 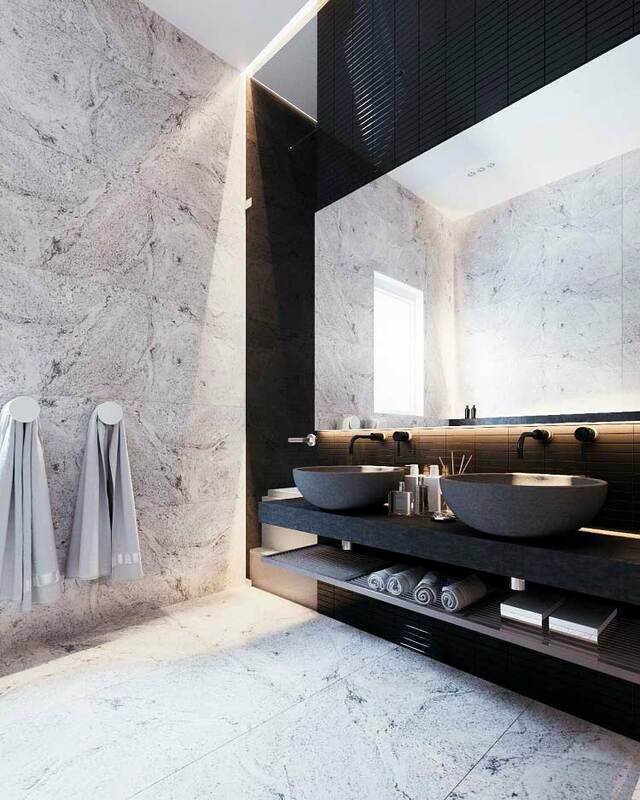 Organic stains often form on shower trays. There are different ways to eliminate them if no product has been helpful. Prepare a small solution with oxygenated water and mix it with a few drops of ammonia and simply let it act on the affected area. Otherwise, the water with ammonia is another variant that helps many times. They are combinations that do not result in acids that can damage the stone. Remember to try a place that is not so visible in the shower before applying it in all the space. 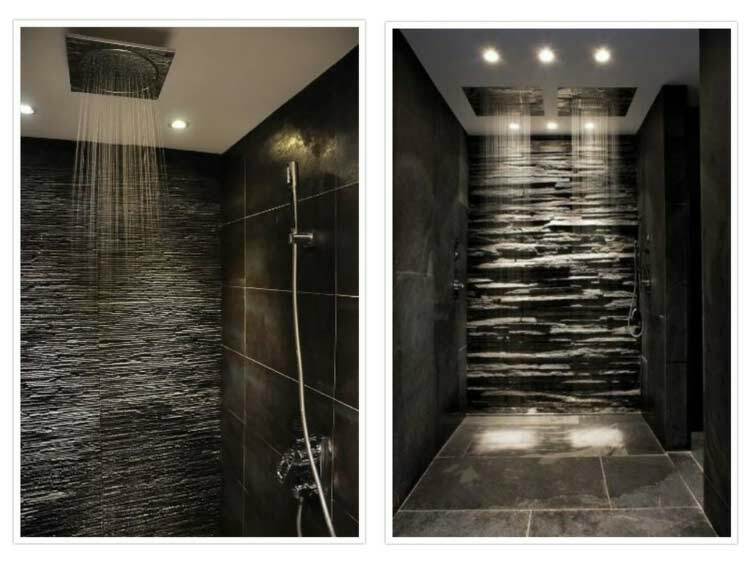 The degreaser diluted in water is another one that is recommended for shower trays of this type. The combination is ten parts of hot water and one part of degreaser. The plastic bristle brushes are what you should use to apply and remove stains later. 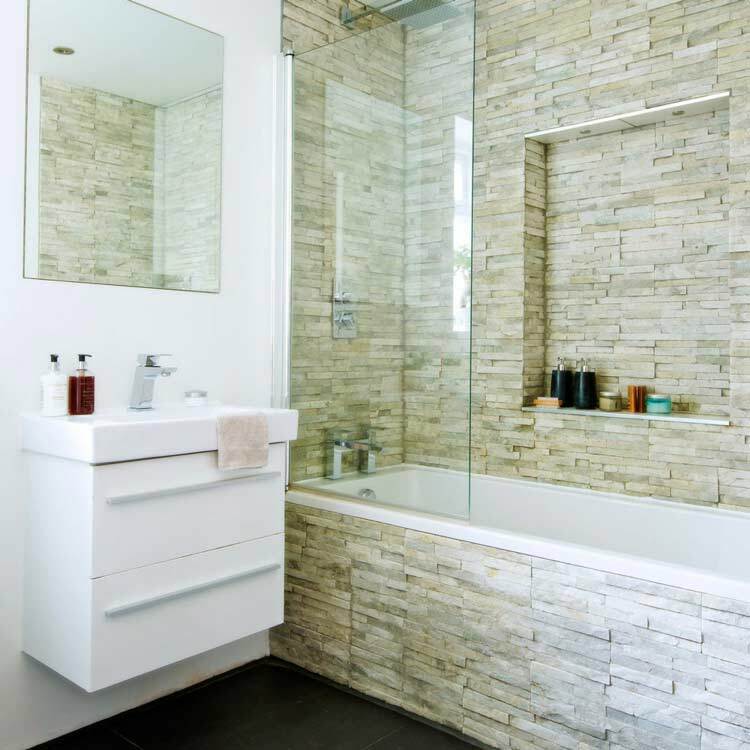 Avoid the use of Legia since its action ends up damaging both the joints and the stone itself. They even get stained so do not use it as a remedy against stains or mold. It is very common to be suggested but the disadvantages are several if analyzed carefully. In the case of marble, special attention must be given to possible materials. 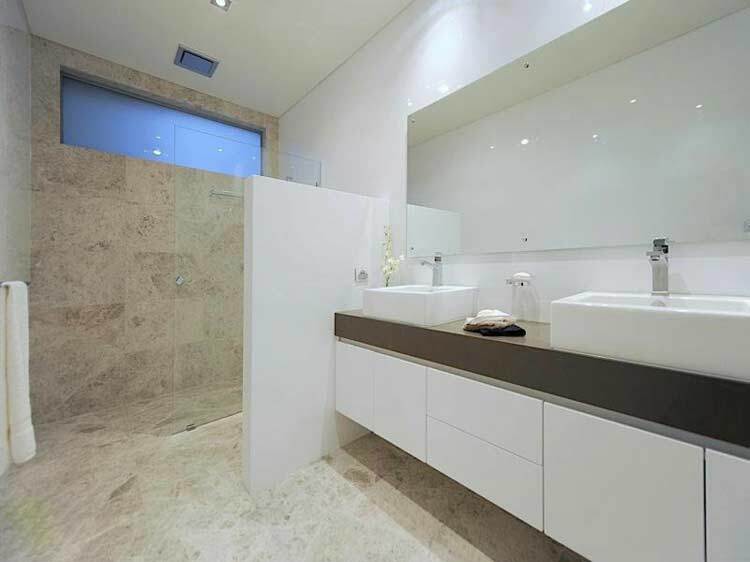 When it has already been installed in the bathroom it is better to do a general cleaning. As in previous cases with special products for this and respecting the indications. A neutral detergent is a great start to clean the entire part if it is a wall. Another treatment after being based on water repellents and odor repellents. These penetrate the stone and directly combat the formation of fungi. The spots are greatly diminished and the beautiful natural appearance of the stones is not affected at all. 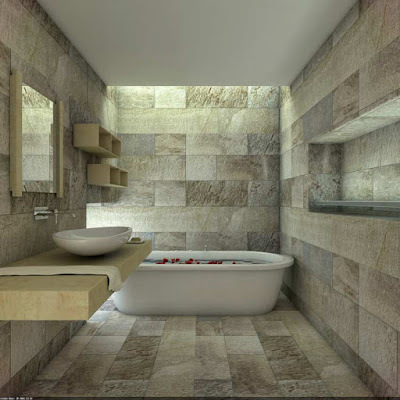 For marble, it is not advisable to use abrasives or some products with alcohol content. The anti-calcareous type is capable of damaging any part in a serious way. So you have to pay attention, some damage to the marble can be irreversible. If you have used polished marble to beautify your bathroom with the passage of time you will notice that it loses its shine. Sometimes partially or totally. It usually occurs in areas where it is in direct contact with water and soap. So that this problem takes time to appear or never appears, the treatment must be with neutral detergents. 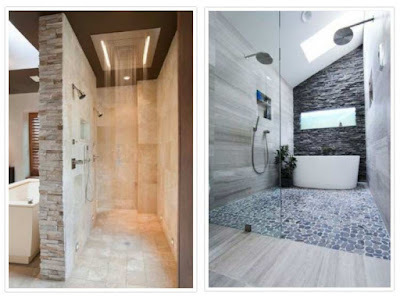 Here we leave you with several inspiring ideas that you can use to create the bathroom of your dreams.